This is one of the highest rated, more expensive hair removal systems/ shavers on Amazon. It’s more expensive for a reason, and here are some of the reasons why. The Braun Silk has more features than a typical electric shaver. The features include: a shaver head, a trimmer cap, a high frequency massage cap, a skin contact cap, a charging stand for an always charged device and a bonus facial brush. These features make it more than just a hair removal system. For instance, the facial brush can be used to clean your face of impurities and give you a facial at home. Also, the message cap can ease the pain of shaving by giving a nice sensation while you shave. It includes 7 extra features that include more than just a hair removal feature. It has a 40% wider epilation head for almost effortless shaving. From one use, it can provide up to 4 weeks of smooth skin. It removes hair 4x shorter than wax does. It has a pivoting head to get an efficient shave. 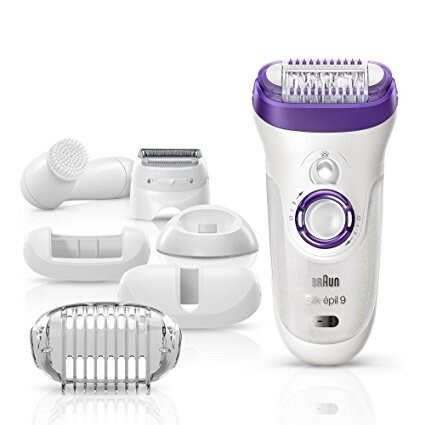 It has a SmartLight, which reveals fine hair for thorough hair removal. Some customers say that it doesn’t hold a charge for a long time. It can be painful to remove hair instead of shaving it. Some customers say it trims the hairs and doesn’t efficiently remove them. Some customers say that it doesn’t work properly all the time. Although this Braun Silk Epilator is on the expensive side, it provides excellent uses for the whole body. It can be used for cleansing the face and shaving the whole body. Out of all the over 900 reviews on Amazon, it has over 850 good reviews on Amazon. Its versatility is hard to beat, and it would be recommended to anyone looking for a quality product. Just be careful about the hair removal process. It can get tricky, but with a little patience, it can work out well. A very versatile product if you have the money the best epilator out there.